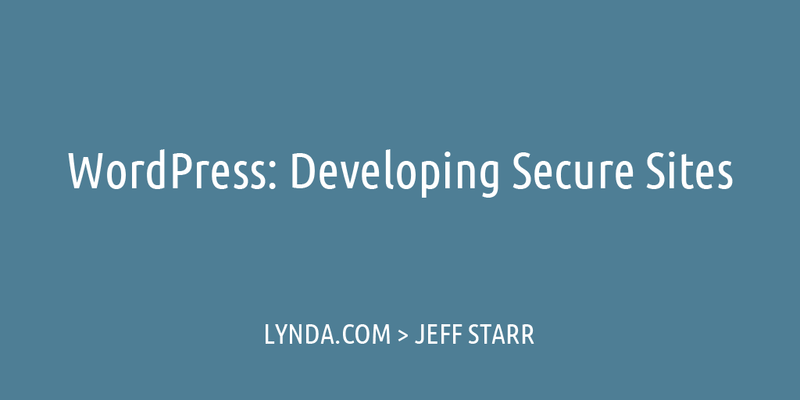 After months of preparation and production, my new video course on developing secure WordPress sites is now available at Lynda.com. This is my second video course on securing WordPress; the first one was originally launched in 2011 and remained in Lynda’s library for over five years. I received a lot of great feedback on the course, and so I jumped on the opportunity to do another one. If there is one thing that I enjoy doing, it’s helping people with WordPress and security. This new Lynda.com course features over 30 video tutorials (over 2.5 hours! ), and is jam-packed with over 10 years worth of hands-on experience securing WordPress-powered sites. The course is aimed at intermediate-level users and is presented with focus and clarity throughout each bite-size lesson. Follow along and discover tons of awesome tips, tricks, and techniques for keeping your site safe and secure. Along with essentials like securing the Admin Area, monitoring users, and implementing a strong firewall, you’ll learn how to protect your site against automated attacks, bad bots, spam, and everything in between. It’s just completely action-packed from start to finish.